There is a smokey nose on the maple bar, which compliments the smell of wine. 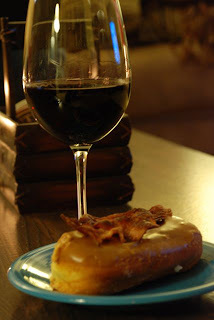 The bacon stands up to the wine, but the pinot portion of the blend is appropriate in a delicious way to the maple bar. Observers note: his eyes totally rolled back into his head. The nose on the wine is not very heavy, it's subtle, but I can't tell if it's subtle because the nose on the maple bar is heavier. Your nose leans more towards the maple bar than the wine when smelled sequentially. Very subtle. The wine by itself is full on the palate just after you swallow it and then it goes away. The flavor is very much on the front half of the pallat, almost bitter. Immediate thoughts is that the maple will overpower the wine, which I feel is true. Too sweet. Saltiness and smokiness of bacon is too much. Would suggest pairing with a riesling instead. The wine really doesn't taste like much since the maple bar is so overpowering. The savory aroma of the bacon melds perfectly with the sweetness of the maple. While sweetish on the nose, the wine gives hues of an oakiness that will connect with the maple better than the bacon. When paired sequentially with the wine, then maple bar, then wine - the wine amplifies the smokiness of the bacon making a near perfect match. A bold merlot might go well? Or a barbera? Overall, a recommended pairing. In short, Voodoo Doughnut bacon maple bars definitely pair with Meditrina. If you're ever near Portland and have the opportunity, I can't suggest visiting any single place more than Voodoo Doughnuts. If you're in your local grocer's wine isle and want a surprisingly unique red blend based on pinot noir, I would highly suggest Sokol Blosser Meditrina. 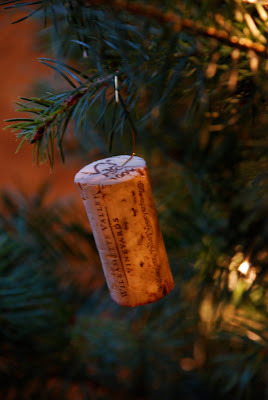 As noted in previous tweets, it also happens to have the best cork ever. Don't believe me? Pick up a bottle and read the cork. Just wanted to give you a quick update on post comments for The Oregon Wine Blog. We held out as long as possible allowing open commenting on our posts. Recently, however, we've experienced a dramatic increase (multiple per day) of anonymous, spam comments. As a result, comments can no longer be anonymous: you can sign in with a google account, openid, wordpress, livejournal, typepad, or AIM account. We value open discourse in the online community, and hope you understand the necessity of the change. 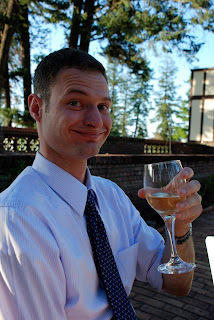 Oh, and look forward to The Oregon Wine Blog's best wines of 2009 coming today! Recently, while contacting several Washington wineries about an upcoming piece on Yakima Valley port, I got a thought-provoking response from Christophe Hedges at Hedges Family Estates. 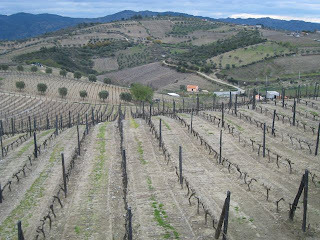 When I contacted Hedges Family Estates regarding their Red Mountain fortified wine, I asked about their port. Christophe responded very clearly; Hedges Family doesn't make a Port. Those are only made in the Duoro Valley, in Portugal. Chrisophe sent me a link to Protect Place and let me know that Hedges is part of the coalition to acknowledge and protect place names. While this is not a new concept to me when it comes to traditional French wines, it's not something that you commonly hear about with regard to Port, port-style, or fortified wines. Based on my working knowledge of the wine industry, if an Oregon-based winery makes a sparkling wine, you make a sparkling wine. You definitely don't make a Champagne. Even the Treaty of Versailles says so. The French went further with the AOC (Appellation d’origine contrôlée), which had its origins in the 15th century regulations of Roquefort cheese. The wine element didn't come into play until 1935. The AOC dictates that in order for a wine to be given the name of a particular appellation, every grape used in that wine must come from within that appellation. In the states, an AVA (American Viticulture Area) designation works similarly, indicating that at least 85% of the grapes come from within that AVA. Because of the AOC and traditions governing wine, they certainly can't make Bourdeaux wine outside of Bourdeaux. There are several Washington wineries making Bourdeaux or Rhone style blends from grapes grown within their AVAs. I had always assumed that wine producers, even those in the 'New World' more or less played by these rules and honored this long-standing tradition in wine making. And in large part, they do. So why is port different? Simple internet searches for "Washington Port Wine", "Willamette Valley Port" or "Yakima Valley Port" produces dozens of hits for wineries and Washington- or Oregon-made wines. In contrast, a search for "Washington Champagne" yields as one of the top hits Champagne Bureau, an organization to protect place names. In part, I think it's because fewer people in the states are drinking fortified wines and talking about them, so the information has less chance to get passed around. In addition, the movement to protect place for Port is not a long-standing tradition: the bodies that regulate Port were formed much later. It wasn't until 1995 that a governing body came into being that represented all farmers and trade professionals, and a similar cooperative mid-century movement included only 10% of regional producers. Definitively, what is a port? From here, "Port Wine is a fortified wine, as defined in EU legislation. It is produced in the Demarcated Region of the Douro under very specific conditions resulting from natural and human factors. The winemaking procedures, based on traditional methods, include stopping the fermentation of the must by adding grape brandy (benefício), making up lots of wine and ageing the wine." At the end of the day, consumers will use the terminology they know and are familiar with. Facial tissues are universally called Kleenex and soft drinks are very commonly referred to as Coke or Pepsi as opposed to cola. 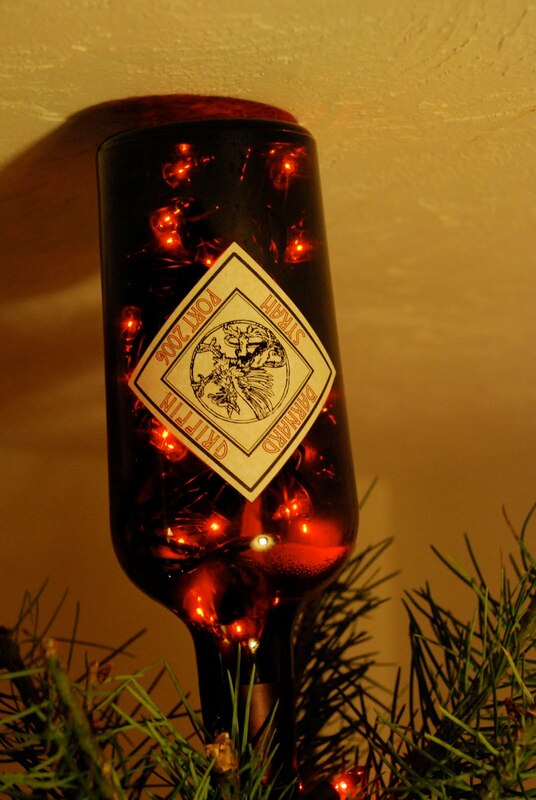 Sparkling wine may remain Champagne in the mind of many, just as a fortified dessert wine will continue to be called port by those who've never been to the Duoro Valley. As wine and fortified wine drinkers become more familiar with protecting place as the movement gains traction, that may change. My role though has definitely changed, and as someone who now writes about wine, I should be using correct terminology. And as someone who reads about wine, if someone asks, you can tell them what a Port really is. For more information on Port, visit Instituto do Vinhos do Duoro e Porto (in English) or The Port Wine. I was in Yakima in October and I had a chance to visit a few of the downtown wineries, I visited three: Kana Winery, Gilbert Cellars, and Plaza Socievole - and enjoyed them all. All three wineries make phenomenal reds, but I want to focus on Kana Winery because their white wine really stood head and shoulders above the competition. 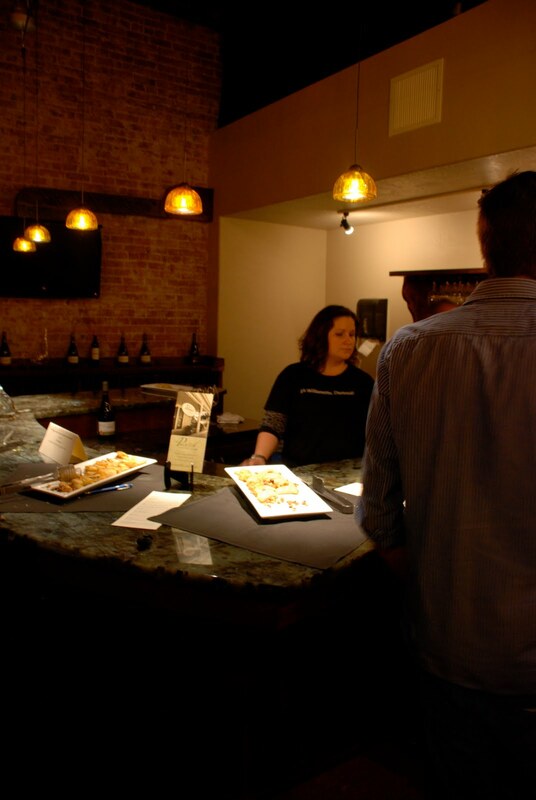 Kana Winery also make excellent red wine; in particular, the Dark Star and Scarlet Fire are excellent Rhone style blends showing the complexity and depth that we have come to expect from Yakima Valley. The Syrah from Plaza Socievole was a classic - and very well done - Yakima Valley Syrah and the Syrah, Malbec, and Allobroges over at Gilbert Cellars were brilliant wines. No one in the Yakma city limits is making white wine like they are at Kana Winery. As more Washington wineries make Rousanne-based wines, those who appreciate a nuanced white wine are reaping the rewards. The nuances and subtleties are present - in spades - in the white wine made at Kana Winery, particularly in the Cuvée Blanche ($18) and The Masterpiece($20). I took home a bottle of the Cuvée Blanche and opened it up to go with Shrimp Fra Diavolo. Normally, I'd be hesitant about a white wine standing up to such an array of flavors, but the Cuvée Blanche was more than up to the task. The Cuvée Blanche has a complex nose of rose hips, hibiscus and orange peel. The palate brings out a chalky minerality, lemon grass and chamomile (though Gwynne disagreed on this point). There's no question that the Cuvée Blanche stood up to the Fra Diavolo, but some of the light subtelties suggested it would be equally amazing with a salad with baby greens, ribbons of Parmesan and marcona almonds. There is no question that this is a wine capable of meeting any challenge - and just as good by itself as it is with food. You still find a strange dichotomy in wine drinkers: those who do not drink one or another "color" of wine. People who will tell you that they are only white wine drinkers or red wine drinkers. I have a difficult time understanding the delineation. Often times white wine drinkers cite a heightened sensitivity to sulfites. Some red wine drinkers eschew white wine for its lack of complexity or their experience with sweeter whites like Riesling or Pinot Gris. For those of you in that camp, I have news for you: Washington winemakers are doing some amazing things with white wine blends. Don't let your preconceptions get in the way of tasting some amazing wines. If you're looking for a white wine experience that will make you glad you read this blog, get your hands on the Cuvée Blanche or the Masterpiece from Kana Winery, any white wine made by Delille Cellars, or the Oriana, a white blend from Brian Carter Cellars. We're down to just three varietals on our journey through the vast and wonderful world of non-traditional wines in the Pacific Northwest. That's right, friends, Oregon is more than Pinot Noir and Washington is more than Cabernet Sauvignon and Syrah. Gasp! Today I bring you a glimpse of Lemberger, or in more fun yet hard to pronounce German vernacular, Blaufränkisch. To once again properly educate ourselves, to the Wikipedia we go where the hamsters have been working late nights to make sure the wine pages are up to date, accurate, and fun. Never heard of it? Neither had I until a few years ago when I visited the winery that provided our sample for this post. 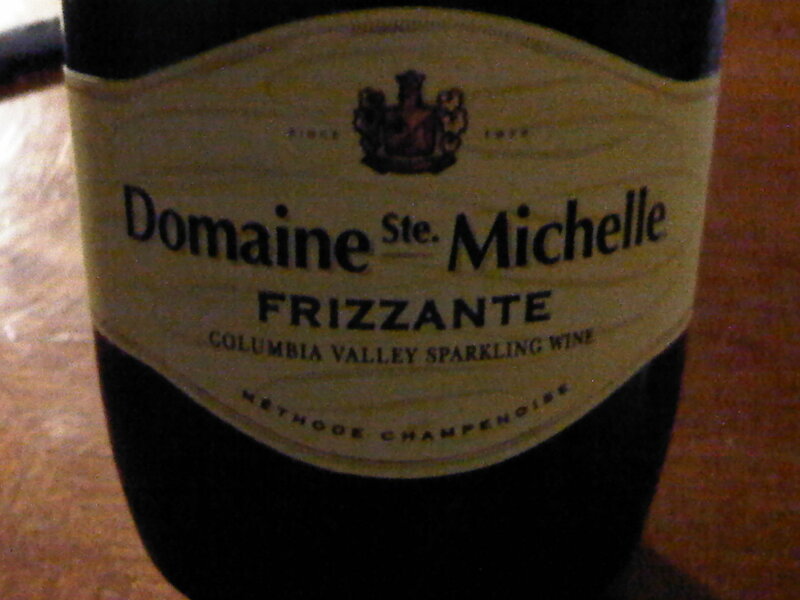 The name of the varietal sounds more like a fungus than a fine wine, but alas, delicious it is. An Eastern European varietal that is relatively obscure in the United States, Blaufränkisch means blue frankish and is the namesake for a dark-skinned, late-ripening variety of grape. The name Lemberger is reminiscent of the first import of the wine to Germany, from Lemberg in the present-day Slovenia. Rich in tannin and exhibiting a pronounced spicy character, it has been called the Pinot Noir of the East due to it's spread and reputation in Eastern Europe. Washington State just so happens to be one of the few major wine regions to have significant plantings of Lemberger, with most of the US fruit coming from the Yakima Valley. 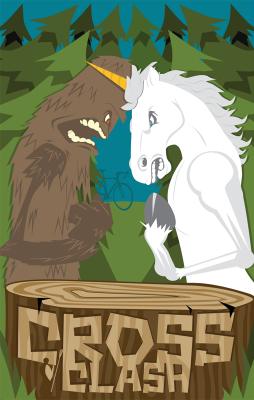 It's also seen relative success on the Olympic Peninsula. Our friends at Kiona Vineyards and Winery, the William's family, provided a sample of their 2006 Estate Lemberger for review in this series. Before I dive in to the wine, let me give you a little aside on Kiona and their role in the Washington wine industry. We've written about them before, for good reason. In 1975, John Williams and Jim Holmes planted some wine grapes on an 84-acre patch of desolate sagebrush near Benton City, Washington with a vision that few others realized. Seeing in the land and climate what nobody else had, Kiona produced it's first vintage in 1980 and never looked back. In working with that 84-acre patch of land, Williams and Holmes pioneered grape growing in one of the hottest wine regions in the country -- Red Mountain. Kiona is still a Williams family enterprise, and for Holmes, he went on to start another vineyard on Red Mountain. Ciel du Cheval...you may have heard of it? Kiona 2006 Estate Lemberger: 100% oak aged Red Mountain, this wine has prominent aromatics of dark fruit and plum, with hints of spice and leather as a backdrop. A gorgeous deep color leads to a nice, drinkable medium mouthfeel with a taste of tart pomegranate or cranberry and a bit of spice on the finish. We loved this wine all by itself, however, it could be paired well with a late-evening Eastern Washington summer BBQ or as Rick noted, the flavor profile would go well with a traditional Thanksgiving dinner. Currently at $9.99 per bottle from the winery, might as well pick up a whole case! So there you have it, today not only do you get to learn a fun new German word and become informed on the history of Red Mountain, but also the intricacies of a unique varietal and a heck of a bargain wine. Really, it's hard to find that kind of wine at that price point. We have just two non-traditional varietals left to cover - Grenache and Cabernet Franc -- which we'll try to pound out before end of the year. It's a rough life being a wine blogger. One area I've been wanting to write about is the ever increasing availability of wine-related consumer technology. It's no secret that I'm kind of a nerd, but you can't fool me either. The statistics we gather from Google Analytics shows that you as well, our readers, are not traditional users of technology. A significant portion of you are accessing our site from Macs, iPhones, and even using Linux. An even larger portion of you are using Firefox, Safari, and other non-Microsoft browsers. What this tells me is that many of you appreciate cutting-edge technology as much as I do and would appreciate knowing what's out there related to wine. If I'm right, then you're going to be intrigued with the following product. 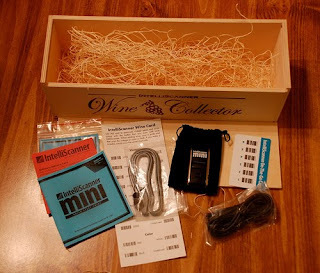 The folks at IntelliScanner were nice enough to send us a review unit of their newest product: the Wine Collector Mini. 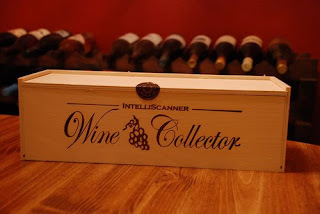 In short, the Wine Collector Mini is a combination wireless barcode scanner and software package used to electronically catalog your wine collection. How does it work? In theory, tracking your wine collection is easy as scanning your wine's barcode and uploading the data into your computer. Once it's uploaded, IntelliScanner's Wine application references your barcodes to its online database and retrieves any available data. Think of it the same as popping a CD into iTunes and having it automatically retrieve song name, artist, album art, etc. - Additional archiving software for items like DVDs, CDs, comic books, home assets, and kitchen-related goods. I have to admit that the presentation of the packaging is absolutely beautiful. It clearly conveys that this isn't just a scanner with some software, but a total package created just for your wine inventory. To highlight a few nice touches, one would be that the custom inventory tages were pre-printed with TheOregonWineBlog.com on them. That was a pleasant surprise as these tags are used for wines that do not have barcodes. Another thing I want to highlight is how small the scanner is. For some reason I expected something the size of a deck of cards, but this thing is the size of the fob for my car. Mini is no exaggeration. Not so great. For the wines that barcodes were found, only two retrieved full and correct information. Five other bottles loaded partial information, but not enough to correctly identify what I actually scanned beyond who made it. The other six bottles? No wines were found in IntelliScanner's database, which means I have to enter them manually. Before I go any further, I'd like to point out what you're thinking and that's that 7/13 isn't a very good return. I agree. Where I think the problem lies is the size of their Wine application's user base. 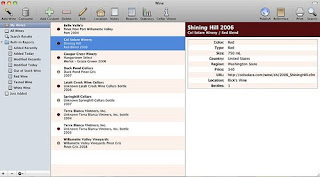 While my bottle of 2006 Shining Hill from Col Solare didn't show up when first scanned, it should now show up for everybody else now that I manually entered information for it. I can imagine IntelliScanner can only scan so many wines on their own without community involvement and, unfortunately, it appears I have different taste in wine than most users. So, would I recommend you go out and spend $279 on the Wine Collector Mini? That depends on what you're expecting. If you're looking for something that makes organizing and tracking your wine incredibly easy, IntelliScanner's Wine application makes it as easy as it gets. While the scanner itself may not record the majority of your wine at the moment, users (like myself) are adding more and more wine each day. If you're looking for something that will scan all of your wine and accurately retrieve every piece of information, I would suggest waiting for future reviews to see if newer users are having better luck. Instead of leaving it at that, I would like to suggest a way to easily increase their database's accuracy and total number of wines: send Wine Scanner Minis out to wineries. As many as possible. 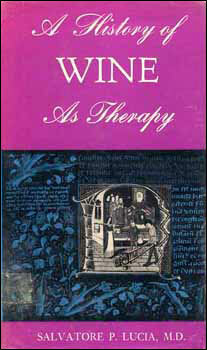 With these in the hands of wineries, the wineries themselves can go through their entire libraries and get scanning. The additional benefit is I'm sure a lot of wineries would really dig the technology and gladly support selling these in their tasting rooms. I've played with quite a few pieces of cellaring software and so far this is definitely my favorite. While I'm kind of disappointed by their database's ability to retrieve information on my wine, I'm very impressed on how easy it is to sort and track my wine. Once it's all scanned, you can even upload your library and keep track of it online! You can purchase Wine Scanner Mini for $279 from IntelliScanner's website or the corded version of their scanner for $179. More and bigger photos can be found on our Flickr Stream. Wine Enthusiast's recent top 100 best buys list inspired us to finally write an article we've been thinking about for quite some time. If you're anything like us, chances are your friends have pegged you as their resident wine expert. Inevitably, your wine novice friends will ask you what wine they should buy. To complicate things, this friend doesn't even know if they prefer red or white wines. They also don't want to spend more than $15. What do you say? Sure, you could create an abbreviated list of wines from Wine Enthusiast's list. You could even take a wild guess and tell your friend to get a specific wine. Another option, which happens to be one of our favorites, is to do something a little different. We suggest an entire label. That's right. Our wine newbie strategy is to give somebody a label and say "have at it." The following two value labels are what we consider to be the absolute safest labels to suggest where not a single wine would be considered sub-par. Columbia Crest's Grand Estates line is the first thing that pops in our heads when somebody wants us to suggest a solid value line. It's one of the few we feel comfortable enough to tell somebody that they can grab anything with a Grand Estates label on it knowing that they'll be pleasantly surprised. If asked specifically what to pick up, we will usually suggest their Cab Sauv as a favorite. Columbia Crest's Grand Estates wines usually range from $6-$10 for white varietals and $9-$14 for reds. Beyond price, the other added benefit is you can pretty much assure that Grand Estates wines will be available at almost any grocer. Look for the label with the tulips, pick what sounds the best, and walk away with a great wine at a low price. To be frank, Barnard Griffin doesn't mess around and this includes their Tulip wines. Like the Grand Estates line, Tulip wines include both reds and whites. One of my personal favorites is their non-vintage Cabernet-Merlot. Of the white offerings, it's worth noting that they offer a rather unique varietal in the form of a Fume Blanc. Your white wine loving friends will feel at least ten times classier! Expect to pay a dollar or two more for reds versus the Grand Estates line, but also be aware that these tend to be on sale almost as often as they're not. Whites will usually run $9-$14 and can often be found on sale as well. Distribution is national, so chances are Tulip wines can be found at your local grocer. So, there you have it! It may sound a lot lazier than painstakingly narrowing down your friends' tastes to a perfect wine, but there's also something to be said for giving somebody the freedom to safely experiment. Anybody out there know of other value lines that you would suggest as universally great? When I first moved to the Northwest, J Bookwalter was making Lot #17, and I remember it fondly, I felt the same about 18, 19 and 21 (which I bought from their gorgeous facility in Richland). A couple years ago (I missed exactly when it happened), Bookwalter decided to really play off the name and go with a literary theme to their wines. Lot became Subplot, and their Riesling has become Anecdote and their Cabernet has become Foreshadow. While this provides a natural and more literary connection to Library Releases, I'm not sure how I feel about it. At the end of the day, the wine hasn't changed and we're all more educated for the change. On a recent weekend we had company in town and drove over to Woodinville to do a little tasting. Without any real plans, we pulled into one of the first places we came upon; at Gwynne's request, we headed into J. Bookwalter's Woodinville tasting studio, which opened in September of 2008. The tasting room itself is on the small side, but is very well done. In addition to the bar and some display areas to showcase the wine, there's a larger dining space to one side. Additionally, there appears to be a smaller private dining area that is separate from the rest of the space. The studio is very tastefully designed, from the wine-related large format artwork to the understated wine racks and the mahogany colored bar. J Bookwalter is in the same complex as Mark Ryan and Ross Andrew, and in the spirit of the Mark Ryan release party, J. Bookwalter was waiving their tasting fee, which is typically $5. We started out with the Subplot #23, which quickly became a favorite, particularly at the price point. The Subplot series is a continuation of the aforementioned Lot series and is a combination of multiple vintages. The #23 consists of small amounts of wine from '08 and '04; most of the blend comes from '06 & '07. It's also a combination of seven different grapes, mostly Cabernet and Merlot, with Syrah, Malbec, Petit Verdot, and tiny bits of Barbera, and Cab Franc. Bookwalter is one of the few wineries in Washington making a multi-vintage wine, and they do a hell of a job with the Subplot series, and they've been doing it for 23 years. The Subplot is comprised of so many grape varietals that you're not able to pick out any particular varietal characteristic. What you get instead is a real treat. At the risk of being cheesy, imagine that a virtuoso solo musician calls a bunch of friends over, and they jam. That melody makes for a completely different, albeit equally enjoyable experience. The nose of this wine gives you a lighter spice and currants. On the palate the wine is red berries, and the big surprise, and selling point where Gwynne was concerned, was the butterscotch. We walked away with a bottle of Subplot #23, and have since purchased two more. The wine is priced at $20 in the tasting studio, but can be found as low as $14 in various groceries. We also had a chance to taste the Protagonist, which was done off the tasting list. The Protagonist is a big, beautiful Red Mountain blend that spent 20 months in the barrel. It's a beautiful wine that would look good in your cellar, and 5-10 years would really make it a treat. The beauty of J Bookwalter is that while they're not among the largest wineries in Washington, they're large enough to make enough wine that you can get your hands on some, but not so large that the craftsmanship is lost. Their Richland tasting room is a beautiful facility that includes a restaurant and a beautiful patio. Get to one of the two locations if you can, and get your hands around a glass of J Bookwalter wine.